Neurosurgeons at the University of Pennsylvania School of Medicine have performed the world’s first robot-assisted spinal surgery to successfully remove a rare form of tumor, from a patient’s neck. Noah Perkinoff, a 27-year-old man from New York, had a car accident in 2016. An X-ray during his treatment revealed he was suffering from Chordoma which is a rare type of cancer where the tumor grows slowly and remains undetected for years. The tumor was located in the bones of the skull base and spine which made its removal difficult without permanently damaging his spine or leaving him paralyzed. A multidisciplinary team of physicians was formed at Penn to review Noah’s case. They decided to treat him not through radiation, but a complex surgery – likes of which had never been performed earlier. 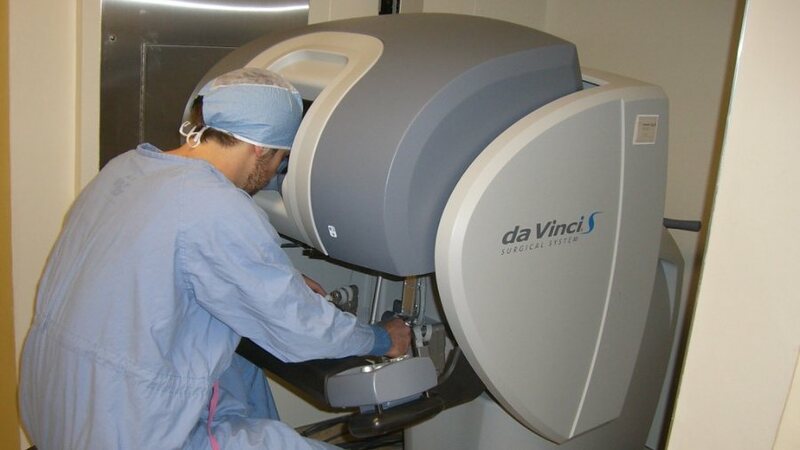 The exceptional feat was performed with the help of Da Vinci’s robotic arms over the span of two days. Dr. Neil Malhotra headed the team of surgeons who took the trans-oral robotic (TORS) approach for this surgery. TORS is a minimally invasive robotic surgery technique that removes benign and malignant tumors from the mouth and throat. This method is first of its kind and was invented at Penn itself. This operation was performed in three phases. First, they used ultrasonic cuts to enter the neck and cut the spine around the tumor. 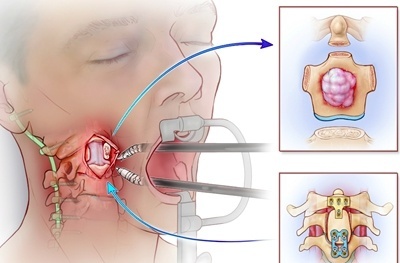 Then a surgical robot removed the tumor through patient’s mouth (as illustrated in the figure). At last, Noah’s spinal column was reconstructed using bone taken from hip and rods for stabilizing it. Even though the surgery was performed in August 2017, it’s only now been made public. Noah Perkinoff has now fully recovered after 9 months and resumed his normal life. The use of trans-oral robot has now made it possible to switch from radiation therapy (which is long and unreliable) to actively removing it as complete removal of tumors is less traumatic for patients and ensures a better recovery.